How Online Does Online Business Have To Be? How Online Does An Online Business Have To Be? What’s the first thing that comes to mind when I say “online business”? Is it working on your laptop by the pool? Taking your business on the road with you? Talking with clients on Skype or Zoom? Having a website for your business? Does it sound exciting or does it sound ‘remote’? Does it sound like something that’s possible or interesting for you or does it sound like something you are not even sure you could make work for what you do? The truth is that you can make your “online” business as “online” as you want it to be. And that can be fully online, partly online or mainly offline with a website to support you. What kind of lifestyle do you want to create and what makes sense for your business? Most (if not all) of us start our own business because we want to live a particular lifestyle. We’re looking for more freedom and flexibility, more opportunities to travel, or more time with the kids or our partner. Having an online business allows you to create more of that freedom in your life. But the best part is that you get to decide exactly what your “online” business looks like and even how “online” it actually is. And you do that by deep diving into who you are and what makes the most sense for you. What does your desired lifestyle look like? What business model makes sense for you? Perhaps it’s that your business is fully online and works as your very own marketing team or maybe it’s that you work at a local in-person studio. Or perhaps you decide to offer online Skype sessions and also have in-person clinic consultations. In online business, you decide how, when and where you do the work. A big part of designing your business is about finding a good fit for you and not about pushing a square peg into a round hole. There’s no one-size-fits-all when it comes to online business and you really can make it look however you want so that it fits you and your lifestyle goals. Cassie Mendoza-Jones is a kinesiologist and naturopath (amongst other things) based in New South Wales, Australia. During the early years of her business, she offered in-person clinic consultations before moving to Skype-based sessions (you can read about her business journey from in-person to online in this post). Whilst Cassie is expanding her online offerings, she still offers in-person events and workshops, as well as speaking at various events across Australia. My business is run completely online. People can schedule a free consult on my calendar, take the Online Business Superstar Quiz, or they can find me via social media, ads, webinars or guest posts and interviews. All of my 1:1 work is held over Skype and I also offer online group programs like IGNITION. For me, I like not having to ‘be’ anywhere in particular so my business is designed to work that way. Natalie Sisson of The Suitcase Entrepreneur is obsessed with freedom and creating a business that supports her lifestyle. So much so that she’s been living out of a suitcase and travelling the world since 2010! Natalie offers online programs and courses, speaks on international stages and her example shows that not only can you have an online business, you can take it anywhere in the world with you. Maybe you do still want to incorporate in-person work into your “online” business, and as we’ve seen in the examples above, you absolutely can do that. Having a better online setup doesn’t mean that you can’t see clients locally (or internationally). You could be a yoga instructor who runs in-person classes and also have an online membership site that allows people from all over the world to take your classes. You could be a naturopath with an in-person clinic and also see clients on Skype or Zoom. Having in-person work doesn’t mean you can’t work with people online. And having an online business doesn’t mean that you can’t work with people in-person. Any and every variation in between is possible. Your ideal business model is on a sliding scale and it can look however you want it to. An online business (or an online side to your business) does give you the opportunity to reach more people with your message, services and expertise. You can only work with so many people in-person (because your time and energy is limited) but you could potentially help hundreds or thousands through an online program or course giving you flexibility and freedom and greater income potential. That’s not to say that one business model is better than the other. Again, it is about working out what lifestyle you want and designing your business so that it fits into and supports that lifestyle. Dive deep into what you are really looking for and what you want to achieve. Then choose your business model based on those goals. Does something scare you about having an online business? Are you resisting the idea of having an online business (or giving your in-person business an online element) because the idea of it scares you? Maybe you are afraid of playing bigger by going global, or you are afraid your online business won’t have the success of your in-person practice. Or perhaps you’re fearful of dealing with more clients or you are not sure how all of the online elements work. Your decision is not set in stone. You can always start small and experiment, test and tweak as you go. You can learn how to use online tools to your advantage and you can work with someone to make sure your business suits your personality and lifestyle goals. 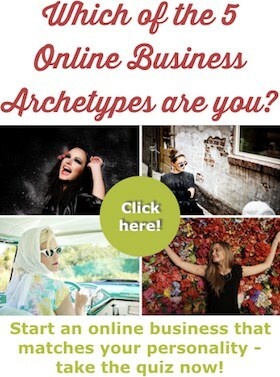 What does having an “online” business mean to you? And do you want to incorporate in-person work as well? “See” you in the comments! Can I Make Money Online If My Business Is Not Helping People Build Their Businesses? ← How Much Of Success Is Mindset And How Much Is Strategy? 2 Responses to How Online Does An Online Business Have To Be? Thanks for this, Cat. For a while I was thinking if I am online, I should not be running all around in person. Then I realized that meeting people is a great way for them to get to know you. Glad to know others work through this and that it can be however I want it to.